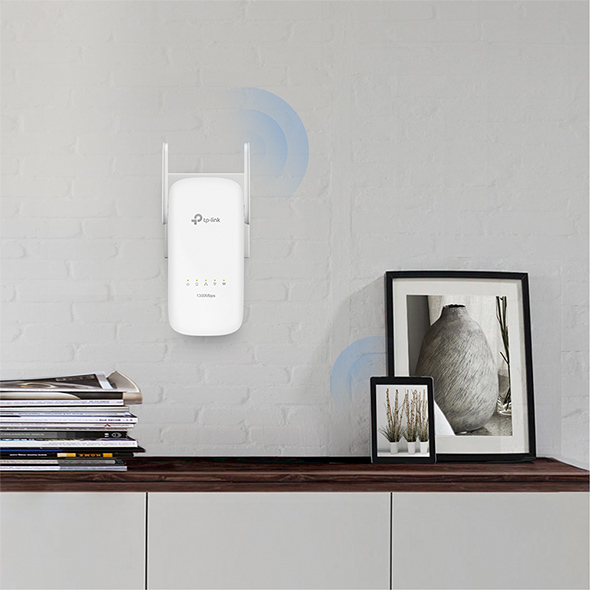 The TL-WPA8630 KIT expands your home’s Wi-Fi coverage into areas where the wireless signal from the main router is weak or nonexistent. 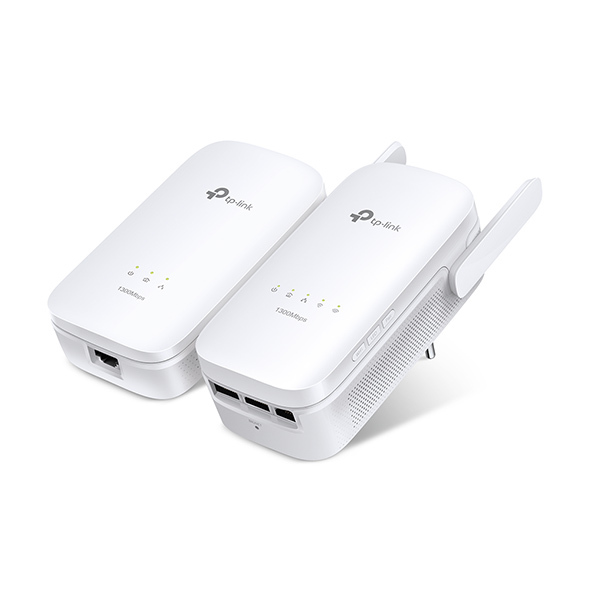 The range extender kit can build a unified network using your home’s existing powerlines and allow you to enjoy Wi-Fi coverage in any area with a power outlet. The TL-WPA8630 utilizes 802.11ac Wi-Fi to deliver dual band connections with combined speeds of up to 1350Mbps, including 867Mbps on the 5GHz band and 450Mbps on the 2.4GHz band. The combination of impressive speed and convenient powerline networking allows you to provide fast, reliable connections throughout your entire home. This is perfect for 4K streaming and online gaming, on multiple devices at the same time. Advanced HomePlug AV2 technology means the extender supports 2x2 MIMO* with beamforming, so users benefit from ultra-fast data transfer speeds of up to 1300Mbps. Perfect for bandwidth demanding activities like streaming Ultra HD video to multiple devices simultaneously, online gaming and large file transfers. *The MIMO functionality within HomePlug AV2 significantly improves data transfer rates, especially during peak use hours. Wi-Fi Auto-Sync creates a simple, intuitive powerline experience. Pressing the Wi-Fi Clone button instantly copies your network name and password from your router for easy setup. Wi-Fi Move automatically applies any settings changes across the network. Your existing Wi-Fi settings will be synchronized to the new extender automatically. 1. Plug the TL-PA8010 in the wall and connect it to the router with an Ethernet cable. Then plug the TL-WPA8630 in any desired power outlet. 2. Press the ‘Pair’ buttons on both adapters to create a secure network. There you go! Just enjoy the seamless, high speed wired and wireless network. ＊ Powerline adapters need to be connected to the same electrical circuit. Equipped with 3 gigabit Ethernet ports, TL-WPA8630 allows you to connect several bandwidth intensive devices such as game consoles, smart TVs or media receivers to the Internet at high speeds, just plug in network cables and enjoy fast and stable wired network anywhere at home. You can easily turn off the LED indicators by pressing the LED On/Off button or control them remotely using the tpPLC app on your mobile device or the tpPLC Utility on your computer. *1. Utility currently supports Windows 8/7/Vista/XP and Mac OS X (10.7 and later) operating system. *2. 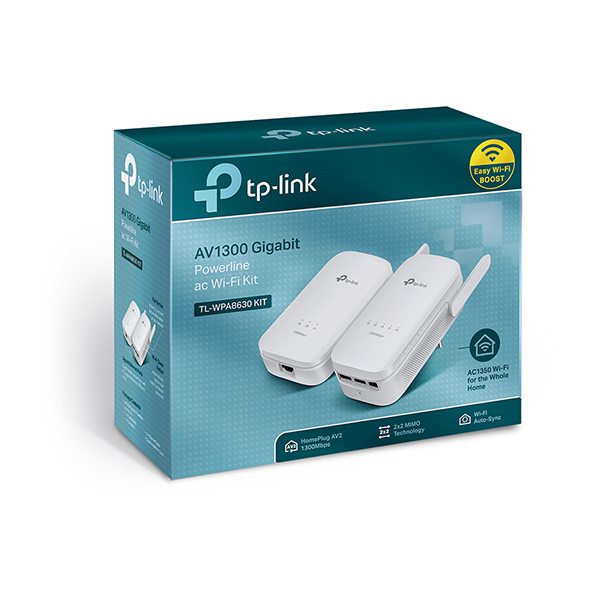 Compatible with all HomePlug AV and AV2 Standard Powerline adapters. This product may not be compatible with routers or gateways with firmware that has been altered, is based on open source programs, or are non-standard or outdated. *3. Maximum wireless signal rates are the physical rates derived from IEEE Standard 802.11 specifications. Actual wireless data throughput and wireless coverage are not guaranteed and will vary as a result of 1) environmental factors, including building materials, physical objects, and obstacles, 2) network conditions, including local interference, volume and density of traffic, product location, network complexity, and network overhead, and 3) client limitations, including rated performance, location, connection, quality, and client condition. *4. Maximum Powerline signal rates are the physical rates derived from HomeplugAV/AV2 specifications. Actual Powerline data throughput and Powerline range are not guaranteed and will vary as a result of network conditions and environmental factors, including electrical interference, volume of traffic and network overhead, AFCI circuit breaker, and Powerline being located in a separate circuit.